Dana Markos Events; Event Design and Floral Styling: Why be on a Wedding themed show? Cash and Prizes! Why be on a Wedding themed show? Cash and Prizes! One of the major new themes that has begun to dominate television networks is anything Bridal. From dress shopping, to full wedding planning coverage, there seems to be shows dedicated to every aspect of Bridal! We decided to take a look at some of the most popular shows, and see what the participants were getting out of being on the show, from money to prizes. Continue reading to see what was in it for them! WE TV's Bridezillas: We've all seen a Bride break under pressure, but no show documents this better then WE TV's Bridezillas! This show follows stressed out Brides throughout their planning process, all the way through their reception, with every problem or mishap that occurs. Needless to say the Bride does not get a a very nice reputation, so why are they willing to be filmed? A fabulous cash prize of course! The WE TV website describes that Bridezilla participants are "Generously Compensated", and Internet buzz claims they receive anywhere from $2500 to $10,000. 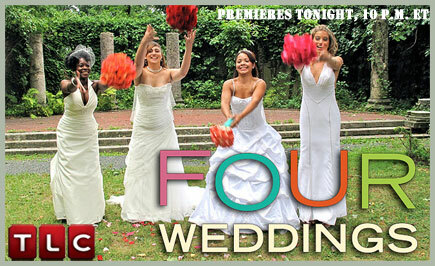 TLC's Four Weddings: Four Weddings brings four Brides in similar areas of the country together, and has each of them attend and rate the other's weddings. They give each woman a score based on their dress, food, venue, and overall experience. The participants don't look as crazy as the ones on Bridezillas appear, but it must be hard to have a group blatantly judging your special day. The perk: The Bride who receives the highest score will receive the honeymoon of their dreams! 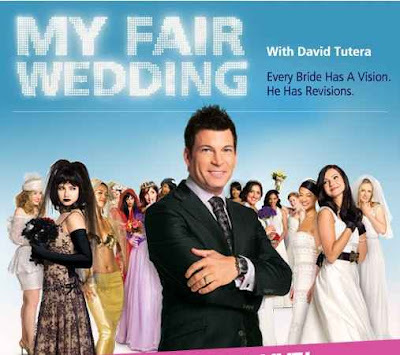 WE TV's My Fair Wedding: On My Fair Wedding, David Tutera helps a chosen Bride completely revamp their wedding, and create something truly spectacular. The Brides who are selected to be on this show receive new dresses for themselves and their bridal party, new decor, gourmet food, a fabulous venue, and even more! It is probably slightly embarrassing for the participants to be judged by what they previously had selected, but with all of the major improvements that David provides, it certainly appears worth it. Bridal themed television shows have definitely taken over major television networks and with good reason! Seeing how another couple is doing it right or wrong is pure entertainment. If anything, it reassures the watcher that when they get stressed with the planning, they are not alone! Andrea and Erin's Wedding: Details on the Dress! Engagment Photos Inspired by Movies...Part 2! !